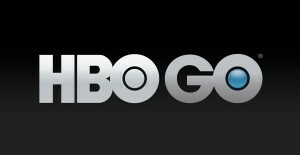 Beginning immediately, Kindle Fire owners are able to take advantage of the new HBO GO app. This app, downloadable from the Amazon Appstore for Android, lets HBO subscribers watch their favorite content on demand right from their Kindle. This means immediate access to, among other things, over 1,400 episodes of HBO’s original content. You’ll find a lot of that content already available through Amazon’s Instant Video store, but how likely is anybody to pay the $2.99 per episode they’re asking for Game of Thrones at the moment even if DVDs aren’t available? Chances are good that if you’re really excited about these shows then you already have an HBO subscription and as such will incur no extra charges when bringing your Kindle Fire out as a viewing option. Amazon has invested a lot of time into making their video selection competitive. The Instant Video service has gone from somewhat helpful at best to being a genuinely persuasive reason to consider Amazon Prime. The fact that the Kindle Fire offers convenient direct access to these videos is a large part of why the device was so important to Amazon’s efforts. After the Kindle eReader took off so strongly they were naturally after a way to turn that model around for other forms of media. Some people were genuinely worried that Amazon’s emphasis on selling video content and Amazon Prime subscriptions would lead them to exclude other providers to varying degrees. This is even more of a concern now that they keep expanding. One of these days there might even be real competition with services like Netflix. It’s good to see that Amazon’s interest in being a part of the digital video business isn’t so important to them that they would make it difficult for apps like this one to get to customers. Subscribers will be able to create their own Watchlists to keep track of things. You also get to mark your favorite shows so that your Watchlist is immediately updated with new episodes as they become available. From what I can tell, this content is out for streaming almost immediately upon airing, so it makes a lot of sense for those of us unlikely to schedule around weekly TV viewing rituals. There will also be access to bonus content. Viewers will be able to pull up behind the scenes extras, interviews with cast and crew, recaps of prior episodes to keep you up to date, and the usual DVR-style interface that we have come to expect. As in most cases like this, if you are viewing a video on one device and have to stop for whatever reason you can pick up where you left off later regardless of whether you are still on that same device. HBO still carries a subscription outside of anything related to the Kindle Fire. This is a great deal if you already have that subscription. If not, chances are good that this will not be quite enough to push you over the edge into buying. It’s a neat app and HBO shows are some of the best in production right now by any measure. That should be your deciding factor. The Kindle Fire access is just a hugely convenient bonus. Amazon has a habit of releasing some very functional mobile apps that subtly encourage customers to use their site more often. Of course the fact that they do this by making these apps into genuinely useful ways to save money makes it rather hard to fault them on it. The most recent of these, and the first one to be released specifically for owners of the new Kindle Fire, is the completely free Amazon Santa app. At the most basic level, it’s nothing more than a pleasantly festive holiday wallpaper thrown across an Amazon.com wishlist building application. It provides the user with a few categories – Music, Books, Video Games, Toys & Games, Movies & TV, Everything Else – to flip through, which can be run through endlessly (or close enough based on my experimenting and the claim of over 500,000 listed products). Presumably these are sorted out based on current popularity, since the product page notes that dynamic updating is a part of the experience. The reason I consider this one worth recommending, despite having a fairly narrow range of application, is the appeal to children for the benefit of parents. The Amazon Santa app lets each kid pick out their own favorites in a separate wish list, then send it off to Santa. While I can’t necessarily vouch for anything that is happening in the North Pole, I can definitely confirm that Amazon will send along some notice to the Kindle Fire owner’s registered email account. This includes a short list of selections from the list, a link to the full list, and other relavent information. It’s worth noting at this point that the company is quick to explain how their privacy applies to kids. Specifically, that no information is in any way linked to the individual identity of a child on Amazon’s part. Also, that it is preferred for parents to handle all naming of wish lists and registration of accounts under their own names. While it is always tricky to market anything toward children in a manner that might pass on important information, in this case it would be difficult to think of Amazon picking up anything unless a parent goes out of their way to put a real name on the related list. The reviews among the broader audience are generally positive, 4 Stars at the time I’m writing this, but there are a couple complaints. There isn’t sorting, nor can you really narrow down what you want to look at beyond the main categories. You also will not be able to make use of the app unless you happen to have a Kindle Fire or an iPad. Definitely important things to note, but if you have the opportunity I would definitely give this one a try. The value is great, especially considering the price. This Thursday, perhaps a little behind the crowd but better late than never, Barnes & Noble(NYSE:BKS) put out their very own eBook Reader application optimized for the iPad. The impact has the potential to be greater than one might expect at first glance, especially given the unexpected success the chain has had in marketing their nook eReader device against the more established Kindle. The big selling point, from my point of view, is the extensive customization of the reading experience available to the user. There are several premade themes for you to choose from, including fairly ideal settings for nighttime reading. You can also make your own reusable themes by adjusting font size(10 available), font style(5 available), background and foreground colors, margin sizes, text justifications, and link coloring. Dictionary integration isalso mentioned, which is fairly useful sounding. 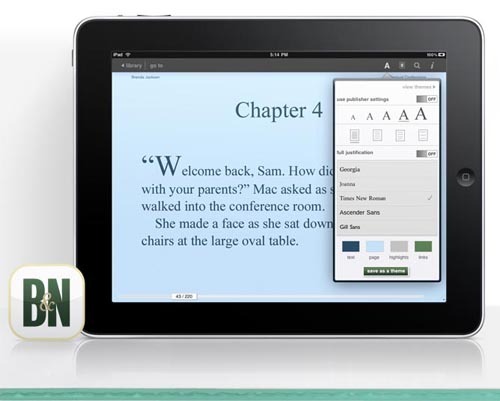 The LendMe feature that B&N is becoming known for is intact in this reading application and users will be able to lend books directly from the iPad. Page turning should be intuitive for most users, with simply a tap or swipe doing the job. In general, all the features we’ve come to expect and desire out of software like this and a few nice little additions. While I would ideally like to see integration with the nook device, at least to the point of syncing up the last-read page in a given book, that’s still not to be found so far. You do, however get integration with the PC app that will allow notes and progress to be saved between devices. Overall, I’d say it’s a great offering and worth checking out if you happen to have an iPad that you like to read on.